I have been a loyal customer of Lao Lane Xang 2 ever since it was created. It is my number one choice in the Southeast Asian food category in Paris, and in fact, I could not imagine my life without this divine restaurant, owned by half Laotian, half Vietnamese brothers. The restaurant is always full and reservations are recommended. However, if you are just two and willing to wait for 15-30 minutes, you usually get a table. But try to call at least one day in advance. The menu consists of dishes from Laos, Vietnam and Thailand. Even if the prices were increased a little bit in early January, they remain very reasonable. For example, we usually order more than enough food, champagne & beer for aperitif and wine with food, and the bill has never exceeded 75€ (for two). 1. 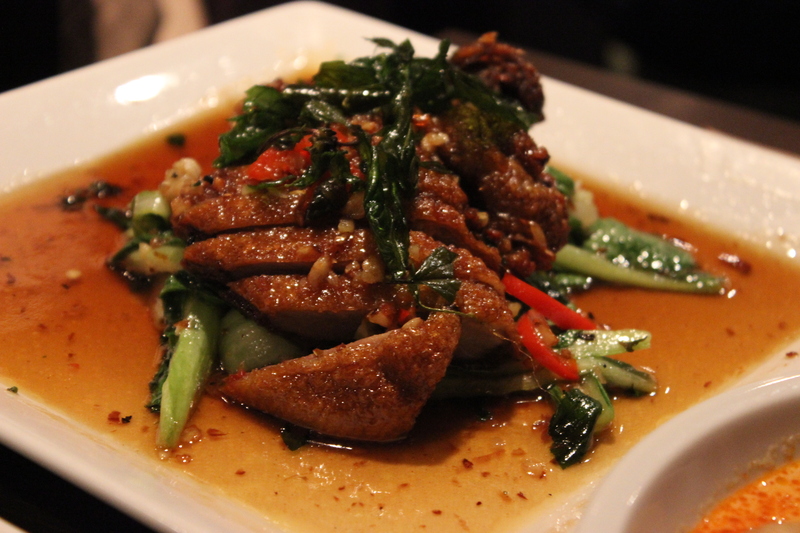 Ped Lad Prik (tamarind duck 13€). This is the house special and the most popular dish. It is simply from heaven. Number L43 in the menu (I know the numbers by heart!). 3. 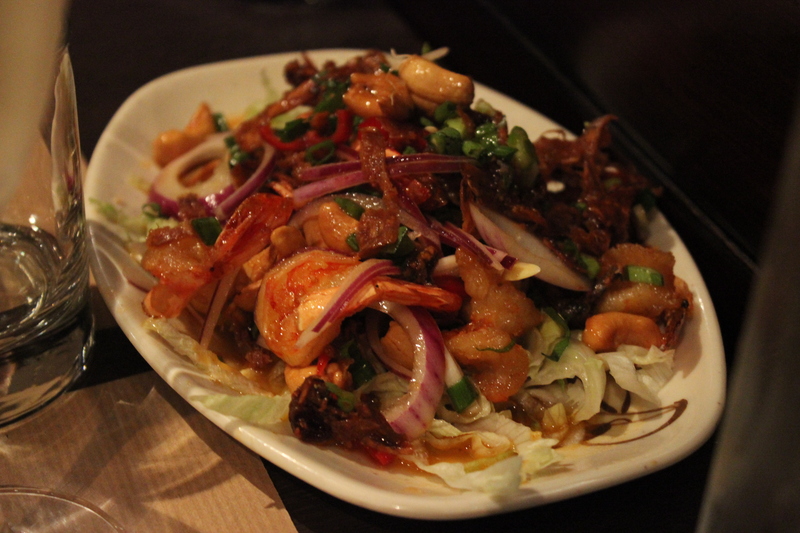 Yam Lao Lane Xang (prawn and cuttlefish salad 10€40). This vinegar-based salad is another favorite of mine. It is refreshing and contains raw red onions, cashew nuts, salad, fried prawns and dried cuttlefish slices. Delicious!! 4. 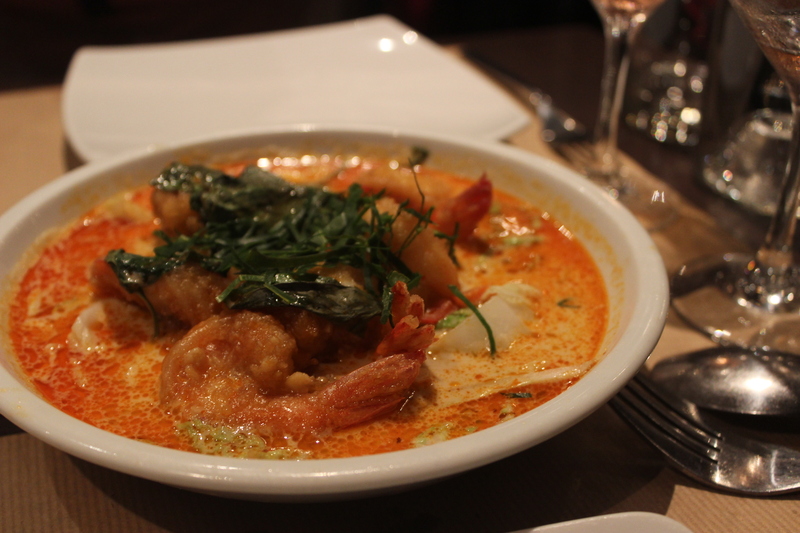 Khung (fried prawns in red coconut curry 12€40). My husband loves this dish but since I usually don’t eat fried food, I find it slightly less appealing. Do not get me wrong; it IS very tasty, but one has to like fried food to like it (well, stating the obvious now…). I usually have a little bit, but I could not eat the entire dish alone. The menu is long and I have tasted at least one third of the dishes. They are all very good, but these four have become my favorite ones over the years. If you are a group of people, then order many dishes and share: the best way to explore Asian cuisine! As to the wine, we usually have wine by carafe (50cl 10€) and find it of rather high quality. A glass of champagne (Philipponnat) costs 8€50 and it is a wonderful choice of champagne. 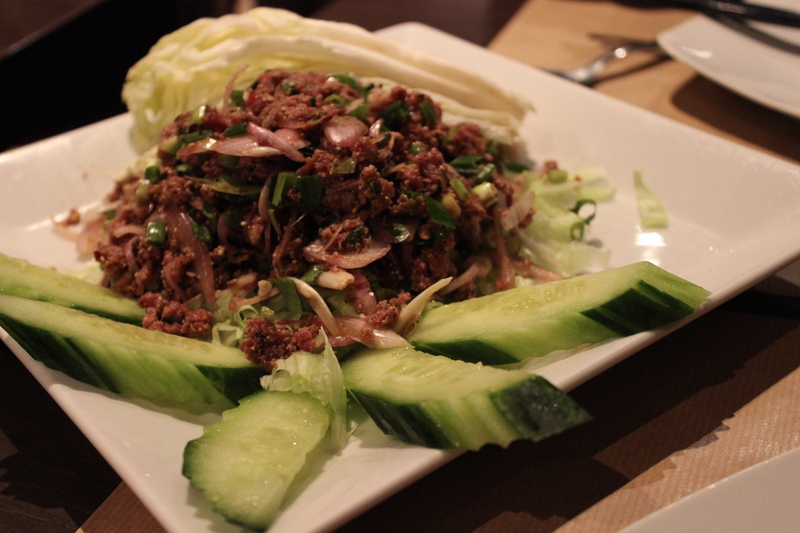 I love going to Lao Lane Xang 2 and find the service excellent and fast. Highly recommended!! PS Come and meet Pearlspotting on Facebook, too! This entry was posted in Uncategorized and tagged champagne, food, Laos, Paris, restaurant, Thailand, vietnam, wine on February 13, 2014 by Miia. It sure looks very delicious! This was not the one we visited? Yes, it is the same! Laap we had with you guys was more raw. Otherwise more or less same dishes, I think. Next time I go there, I will order the duck for sure! Nice post. Thanks! Do you know LLX2? The duck dish is The Signature Dish that I order every single time. Nice mix of greens, meat, garlic, basil etc. Let me know how you like it!! 8,50€ for champagne glass? Finland is not that expensive then when it comes to Champagne. In Paris champagne by glass is usually 10-12€, and the fancier the place, the more expensive it gets. 8.50€ is a very good price. And philipponat is a good champagne. It is basically more expensive due to alcohol tax, but price range for basic champagne is 10-16€ depending on if it is 8 cl, 10 cl or 12 cl glass, of course. In fine dining restaurants prices start from 15€ but then it is not basic Mercier or something like to that. Last couple of years there has been interesting bottle offers starting from 39€. Posted about one Nicolas Fauillette promotion late 2012. Have also enjoyed of these offers couple of times. Wow, 39€!! I think I have never seen it this cheap in Paris. Where is it in Helsinki? I wonder how they do it considering transport costs and taxes…. ps I think it is always 12 cl here. Miia..this is wonderful review. I think I do have to visit this place when in Paris! Thanks so much!! – oh I will infor my friend in paris as well about your post, I am sure she will love it! The family had their original restaurant on the opposite side of the street. There were three restos next to one another at one point, but I think one is closed now. This Lao Lane Xang II is their newest addition, and nicest looking. It has two floors, a terrace in summer, and the food is better than on the other side of the street. A super popular resto where you always have to queue (even reservations can difficult to make so be prepared to show up and wait).